Discussion in 'Effects, Pedals, Strings & Things' started by Enusire, May 7, 2016. Just wanted to share this good day with you. Two days ago I traded a DD20 + Morning Glory V3 for a Timeline. It arrived today. It is 2-3 years old but the condition is stunning! Now I have swapped the Timeline with the DD500 on my main board. When I have finally decided which delay I will leave on my board I will wire everything up neatly, underneath it´s a little bit messy at the moment. 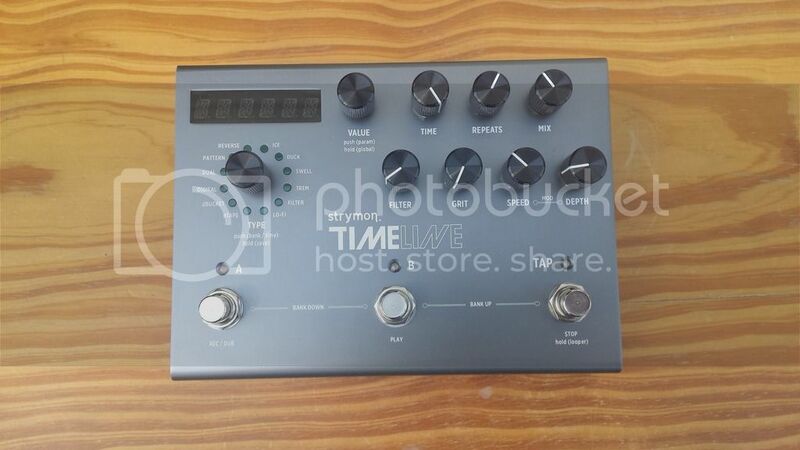 I´m searching at the moment for a MIDI to USB converter so that I can update the Timeline with the newest software. Any other tipps & tricks for the Timeline? TheRealDeal, thesooze and leziv like this. I use it to switch through the banks. thanks man. I already have a Disaster Area DMC-7D. I only have to hook it up with the Timeline. I just bought one and a DD500 on the see day with the plan to return the one I didn't like. It was pretty instant that I preferred the Timeline. I really like the Drucker and tape delays. Running in the fx loop of my new Carol Ann Tucana 3r. Sounds fabulous. what do you mean with "Drucker"? Mark.B, Jason Calieri and earwax like this. I was guessing it was autocorrected from "Ducking." Mark.B, ThinPaperWings and Enusire like this. thanks. I asked due to the fact that I´m from Germany. Nowadays I understand nearly anything but sometimes there is a word I don´t get and have to look up. Congratulations on the Timeline! It's mint ! Looks like it's brand new. 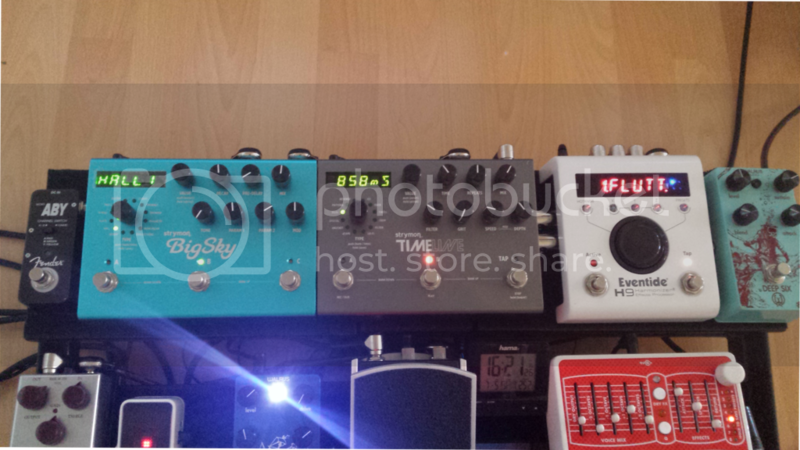 I have the Möbius, Timeline, and Big sky at the end of my pedalboard. Absolutely stunning effects. Looking into a MIDI controller as well. We play a lot of '80's Rock/metal but we do "dial it back a bit" with other songs from the '70's, '80's, '90's that require a much cleaner sound and this is where these pedals shine. The presets, alone, on the Timeline will inspire your playing. Again, congratulations and enjoy ! Thank you for your kind words, very nice to read! I've had my Timeline since not long after they first came out, and still find it inspirational. + LoFi is a REALLY cool engine and can do more than just bit-crushed delays - it's got the shortest delay available in 2ms so can do some cool doubling effects. ThinPaperWings, korpret1, Meriphew and 4 others like this. wow, thank you so much for taking the time to elaborate this!! I will definitely consider the things you´ve pointed out. Cheers mate. How does the H9/Timeline/Big Sky combo work for you? I have a Timeline and H9 already and bought a Flint but I think I should've maybe gone with a 2nd H9 or a Big Sky instead. I've owned a lot of delays over the years, and the Timeline is still my desert island delay. broken_sound and Enusire like this. Having the TL under MIDI control really maximizes it's potential. I am just getting my core basic sounds setup with a new amp and will be working on more sounds with it. ThinPaperWings and Enusire like this. So, I got my TL these days! And I didn't get the point of this FX Loop. I tried a Mr. Black Eterna running in TL Loop, but didn't notice any difference from it running in the regular way. What is the point of this FX Loop?